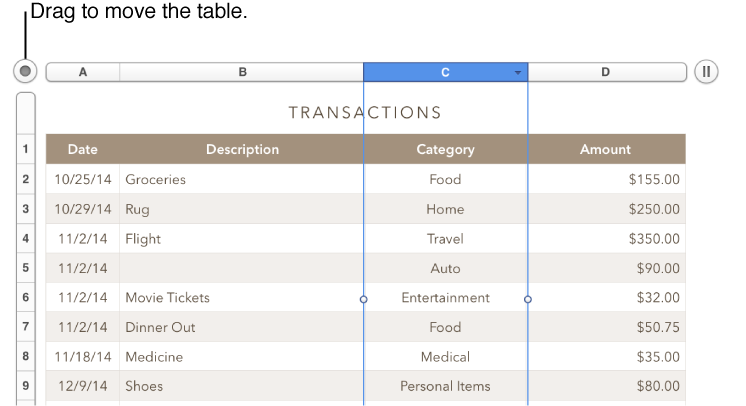 Numbers provides predesigned table styles for each template. After adding a table, you can customize it however you like. You can add as many tables as you want to a sheet. Click Table in the toolbar, then select a table layout. To change the appearance of the table or its cells, use the tools in the Table, Cell, Text, or Arrange panes of the Format inspector. When you add a table, it has a placeholder name (such as Table 1), which you can change or hide. Each table on a sheet must have a unique name. Show or hide the table name: In the Table pane of the Format inspector, select or deselect the Table Name checkbox (below Headers & Footer). You can also show or hide the table name without opening the Format inspector. Click the table, Control-click the numbered bar to the left of row 1, then choose Show Table Name or Hide Table Name. Click the table, click in the top-left corner of the table, then press Delete. Note: If a table is linked to a form added in Numbers for iOS, deleting the table clears the form.